To view this blog post in Spanish, click here! I think we can all agree that amniotic eggs are delicious. They also happen to be one of the best sources of energy out there, and this is at least partially why we, and many other animals, enjoy eating them so much. In addition, they rarely fight back, and they almost never have physical defenses, such as spines, or chemical ones, such as deadly toxins. In fact, on the inside they're pretty much all lipids (a group of molecules including fats and cholesterol), surrounded by either a leathery (in monotremes and most reptiles) or a hard, calcified (in birds) shell. I've already written about a species of burying beetle that specializes on snake eggs, apparently with great benefit to its fecundity relative to other burying beetles that use carrion. Turns out, snakes aren't above specialized oophagy themselves. There are a few snakes that eat anamniotic eggs, such as the turtle-headed sea snakes (about which I've written before) and the South American goo-eaters. These have many amazing adaptations to eating shell-less eggs, but I'd like to focus on the amniotic egg-eating snakes for now. To review, an amniotic egg is one with a shell and several other embryonic membranes, called the amnion, chorion, and allantois. These structures physically protect the embryo and facilitate gas and waste exchange between the embryo and its surroundings, because the shell is too thick to allow the embryo to breathe and excrete by diffusion alone. These eggs are laid by birds, many reptiles, and monotremes (egg-laying mammals such as the platypus and echidna). In placental mammals (including humans), which are also amniotes, some of these structures are part of the umbilical cord, while others are vestigial. Amniotic eggs are adapted for being laid on land, and even the most aquatic of amniotes, such as sea turtles and pelagic birds, must come to land to lay their eggs. Because of the resilience and self-contained nature of amniotic eggs, many organisms that lay them have done away with parental care. Choosing a nest site, usually under a rock, log, or pile of poop, or in a nest dug underground, is the extent of it. Beyond that, a female snake or turtle will most likely never see her kids hatch, let alone grow up, graduate, or become successful. This also means that their eggs are basically undefended from predators, except for being concealed and not smelling very much. Birds are slightly better parents, but they risk giving away the location of their nest to predators by flying back and forth to it many times a day. Experiments conducted by herpetologist Steve Mullin and ornithologist Bob Cooper have shown that gray ratsnakes locate bird nests over twice as quickly when parents are attending than when they aren't, a phenomenon so prevalent that it has its own name (Skutch's hypothesis) and is thought to influence the evolution of optimal clutch size in birds (because more offspring need to be fed more often, necessitating more trips to and from the nest and increasing the likelihood of detection by a predator). Ok, enough - let's get to the pictures of snakes eating eggs! Damn, that's impressive. If you watched the video above, you saw an African Egg-eating Snake, perhaps the most specialized oophagous snake there is, swallow a bird egg whole, crack it open, and regurgitate the shell. How does it do it? The highly kinetic, flexible skull of this snake allows it to maneuver its jaws around an egg many times bigger than its head, despite the smooth, round surface and the snake's lack of hands. It'd be like a human trying to eat a whole watermelon. Egg-eating snakes lack teeth almost entirely, not needing them for gripping their prey. 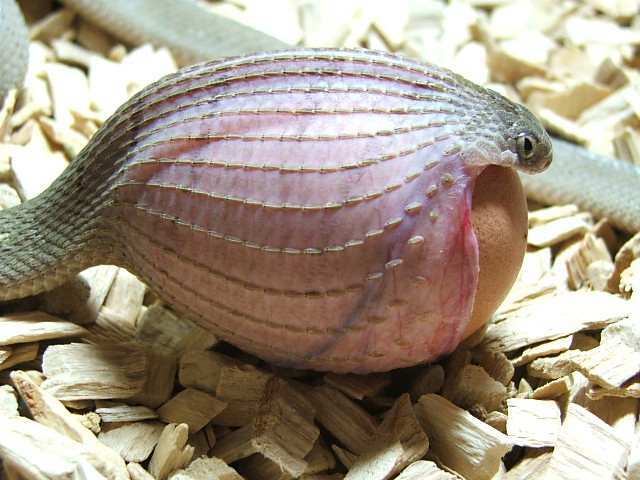 In addition, the snake's skin is stretchy enough to accommodate the egg's passage - the scale rows are clearly visible, widely separated by the skin in between. Most of the time, this skin can't be seen, because the skin is relaxed so that the rows of scales are in contact with one another. Starting at 2:45, you can see the moving x-ray of the egg-eating snake swallowing the egg. Continuing through the end of the video, the snake cracks the shell, allows the yolk inside to drain into its stomach, and regurgitates the eggshell. Most amazing, young Dasypeltis don't appear to have these hypapophyses - they grow as the snakes get older, which raises questions about what the juveniles eat. Even though eggs are nutritious, Dasypeltis must feed relatively often for a snake - one that my advisor kept in captivity ate several quail eggs a week. The adaptations of the nine species of Dasypeltis allow them to eat eggs that are very large relative to their body size, and as far as we know they eat almost nothing else. Several generalist snakes also eat eggs; adult Eastern Kingsnakes (Lampropeltis getula), Western Hog-nosed Snakes (Heterodon nasicus), and Formosa Kukrisnakes (Oligodon formosanus) frequently consume reptile eggs, and many members of the rat snake genera Pantherophis and Elaphe opportunistically feed on both eggs and nestling birds. These snakes, however, have no special morphological or behavioral adaptations to assist them in the consumption of eggs. 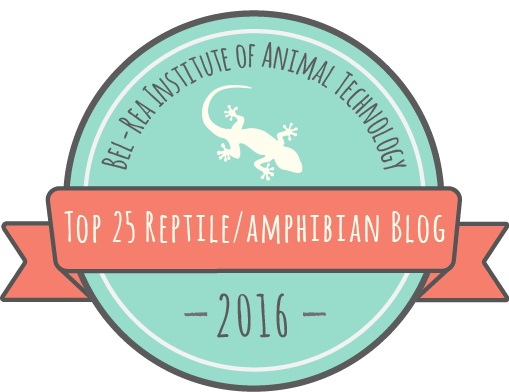 One species, the Japanese rat snake (Elaphe climacophora), can ingest relatively large eggs, and has several vertebral hypapophyses. However, E. climacophora ingests the entire egg, including the shell. Only Dasypeltis, and possibly a poorly-known species from India called Elachistodon westermanni, specialize in ingesting large eggs, then crushing the shell and retaining solely the contents. Thanks to David Marti, Armata, Tony Phelps, and the BBC for images and videos. 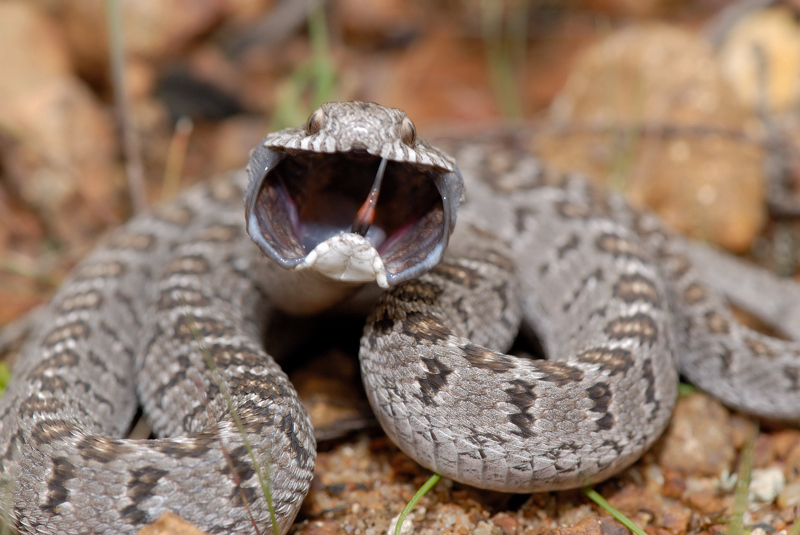 which is the largest specie of dasypeltis? wat is de grootste soort dasypeltis ? Great question! I've got to admit, I really don't know off the top of my head. Dasypeltis scabra is one of the most widespread and best known. I'll look in the literature and get back to you. It seems to be Dasypeltis scabra, at just under 1.2 meters. Thank you David! I didn't know where it was from, I think someone else had labeled it as D. scabra. I've changed the caption and added your name to the acknowledgments.